Take your pick from sweet bell peppers, spicy chile peppers, Hungarian cherry peppers, or mild, tangy pepperoncini. They can all be roasted in the oven. And, if you plan to roast one, go ahead and roast many, because they store well, up to four days in the fridge. What's even better is that all peppers pack a big nutritional punch. 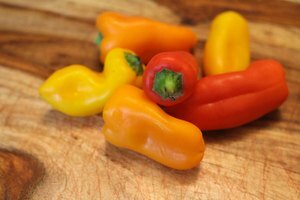 All peppers are fat-free, low in sodium, low calorie and full of vitamins. Bell peppers, for example, contain high amounts of vitamin C and a little heart-healthy capsaicin, and jalapeno peppers contain vitamin C, vitamin A and folate and lots of capsaicin. It does take a few more minutes, but thorough washing is a necessity for any type of pepper you plan to roast. 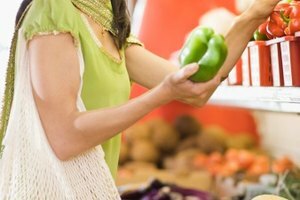 The Environmental Working Group lists both bell peppers and hot peppers on its Dirty Dozen list of vegetables with high levels of toxic pesticides. 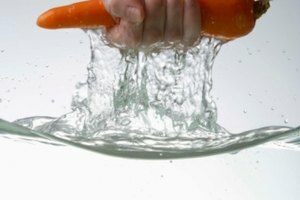 Use a little elbow grease to scrub the peppers under running water because it's the healthy thing to do. Organic peppers don't have the same problem with pesticides, but it's still a good idea to wash them thoroughly to remove traces of dirt or bacteria. You can either place peppers on a baking sheet whole, or cut them in half or in pieces. A small amount of nutrition is lost during roasting, but cooked peppers are still a healthy vegetable, so no worries on that score. For pieces, cut the pepper in half and remove the stem, seeds and white membranes. Toss the peppers in heart-healthy olive oil to keep them from sticking to the pan, and season them with salt and pepper to bring out their full flavor. A word of caution — some hot peppers really are hot. Wear gloves when washing and cutting any chili pepper. Bake the prepared peppers in the oven at 400 degrees Fahrenheit. Whole peppers take longer to cook than pieces, anywhere from 10 to 30 minutes depending on their size – a big negative in the eyes of any busy cook. Pieces take from 10 to 20 minutes depending on the level of doneness you want, whether slightly crunchy or very soft. Turn or stir the peppers halfway through cooking. A bit of black char on the peppers gives a tasty bitterness that balances the sweetness of bell peppers and adds another dimension to hot peppers. If you're looking for the quickest cooking method for peppers, go with broiling cut or whole peppers at the oven's highest broiling level. Whole peppers need to be turned once or twice during the 5 to 10 minutes of cooking, and cut pieces might need one turn of the pan under the broiler. Place either type on a pan to catch juices. Broil the peppers until the skins are blackened and blistered. Then, place the peppers in a paper bag or in a bowl covered with plastic to finish cooking by steaming, about 5 more minutes. To use the peppers, pull off the charred skin, leaving any little bits on for a nice smoky taste in whatever recipe you use. 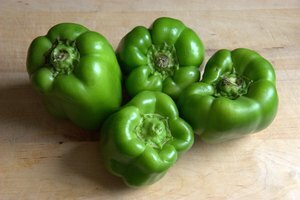 Bell peppers – as with the people in your life! – are more pleasing with a little acidity to deepen their complexity and to add multiple dimensions to their taste or personality. Toss the peppers with some sherry vinegar before placing them on top of your vegan portobello mushroom burger, or add them to a salad sprinkled with fresh basil or thyme. Balsamic, red wine or sherry vinegar also adds depth to hot peppers. Or, toss the peppers with lime juice, minced garlic and ginger for a smoky salsa with a kick.